We were there at the end of August and stayed in site 10. It was not a lake front site but we took what we could get. Osoyoos is always very hot, but the good thing is there is often a wind coming off the lake. It’s a hot wind but at least it’ a wind. The downfall with the wind, you can’t really tarp for shade and sometimes it is even risky to leave your awnings up . That being said, if you don’t like the hot sun, you likely are not booked in Osoyoos. One of the most unique things about the campground were the quails. They were everywhere and they very tame. The kids loved to watch them scurry around the site. Haynes point has water on 3 sides but if you aren’t lucky enough to get one of the lake front site then you have to walk to the campground beach or drive into the great city beach. 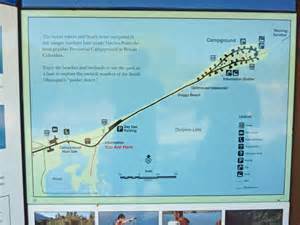 It is not a long drive into the city beach (Gyro Park) and there is also a great tourist strip with mini golf, ice cream stores and lots of other tourist attractions. 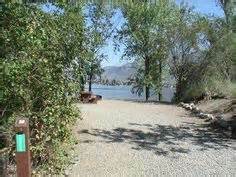 There is not shortage of things to do in Osoyoos and being a desert climate there is always great weather to enjoy. Recommended Sites: It has been 10 years since we camped at Haynes point so may notes are limited and likely very old. I will write what notes I have and update them the next time we are in the area. I noted double sites 22/23 as well as 27/28 as good. Best on their location they have the best chance as some shade and you can position your camping vehicle to increase the shade. They also had reasonable access to the lake. (that may have changed over the years.) For single sites I would try to get 20 or 25. They had good privacy, access to the lake and you could position your vehicles to increase your shade. ← Cool Camping Couch that stores in a bag! Really? Magnificent website. Lots of usful info here. I really appreciate your feedback. It has been a fun blog to start.